A Brazilian samba school, which is alleged to have received funding from Equatorial Guinea, has been crowned champion of Rio de Janeiro's carnival. Beija-Flor, one of Rio's top samba-schools, told the story of the African nation in its carnival parade. The group said it had received support from the oil-rich nation, but denied reports that it had been paid more than $3m (£1.9m) for its choice of theme. President Teodoro Obiang is believed to be one of Africa's richest men. Many Equatorial Guineans live in poverty despite 20 years of oil production. Mr Obiang seized power in a coup in 1979 and is the longest-serving leader in Africa. Amnesty International has called for transparency and said Rio's world famous carnival should not be sponsored by a man it accuses of serious human rights violations and corruption. Controversy apart, Beija-Flor (Portuguese for hummingbird) was always among the favourites to win the Rio carnival parade. A panel of judges gave the samba school a near perfect mark in nine categories, ranging from costumes to the quality of the samba song composed specially for this year's event. 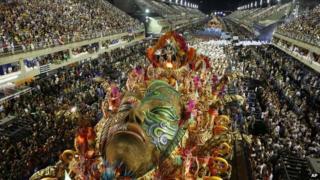 Beija-Flor has now won the fiercely contested Rio carnival parade 13 times. Only older groups Portela and Mangueira have more titles. The top six samba schools in this year's event return to the Sambadrome on Saturday for a celebratory parade, marking the end of the carnival. In 2006, samba school Vila Isabel was criticised for allegedly accepting funding to praise the government of then Venezuelan President Hugo Chavez. Correction: An earlier version of this article contained a picture which was captioned: "President Obiang was among some 70,000 people who attended Beija-Flor's parade at Rio's Sambadrome." The BBC now believes the man shown was not the president.